Somehow a packed calendar/agenda seems to be an indicator of our “success.” We live in a 7/24 world, we have more work than we can manage, and we constantly fill our calendars with activities. It impacts people at all levels. I’ve told this story before, but it bears telling again. About 15 years ago, I was working with a Fortune 100 organization. It was struggling terribly to produce results and grow in a very turbulent market. As I met with people, I notices how busy they were, their calendars were filled from the morning to evening with meetings, many had multiple meetings scheduled concurrently. These were outstanding professionals, extremely smart people, but for some reason just couldn’t produce the results to grow the company. And it was through no lack of effort. I became curious about the number of meetings and their “busyness.” I was intrigued about the scheduling of several meetings simultaneously. Fortunately, for some reason, I could see the calendars of all the top executives. I discovered the CEO had a practice of scheduling 2-3 meetings simultaneously. They would be in adjoining conference rooms and he would move from meeting to meeting, multitasking. He said, “But I can’t get things done without doing this!” As we discussed, I showed him the calendars of his direct reports, and those several levels down from him. All of them were emulating his behavior. All were scheduling 2-3 meetings simultaneously. It was no wonder they weren’t accomplishing much. There was less than a 30% chance the right people would be in any meeting to get things accomplished. People were scheduling meeting after meeting, but seldom having the right people in the meeting. As a result, they’d schedule another and another and another. It took a while, but they started getting more done, simply by having the right people “present” in a meeting. Today, I attend meetings and see similar behavior. People are physically in attendance, but the are rarely there. They are on their smartphones, laptops, tablets. They believe they are productive doing multiple things at once. Yet they are distracted in ways similar to that CEO and his leaders. As a result nothing gets accomplished. But multitasking is just one aspect of the “busyness” challenge we face. Frankly, there’s a bigger challenge, it’s Cognitive Overload. That is, it’s what’s happening to each of us and our ability to deal with the overwhelming numbers of interruptions, demands for our attention and information overload. It has to do with the quality of our professional and personal lives, and our abilities to achieve. We kept discussing, but for some reason I didn’t quite get it. Little did I know, she was way ahead of me in her thinking. Fast foward to about 2 months ago. I saw Jill again, we talked about her book, she said, “It’s about overwhelm.” It turned out in the intervening year, I’d started reading about brain science to learn more about Cognitive Overload. When Jill told me about the book, all of a sudden the light went on for me. She had been focused on the bigger issue all of us face, Cognitive Overload and being Overwhelmed. It’s really about the level of personal distractions we face and the impacts they have on our health, our success, our ability to get things done, and our happiness. It’s about how our brains work and respond to all the things that conspire to distract our brains–even for a millisecond. The vibration of our phone in a meeting–even though we may not look at it, the mail message that pops up on our computer screen, and so forth. Each of these distractions takes a toll on us. 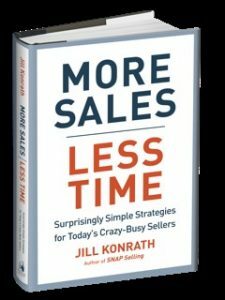 Jill’s latest book, More Sales, Less Time is about this issue, Overwhelm/Cognitive Overload. Jill studies brain science, how it works, what happens when we are overwhelmed with information, messages, and distractions. More importantly, over the past year, Jill performed experiments on herself. She tested a variety of tools, methods, approaches to better understand the Overwhelm she faced, and how to manage–even escape it. At a time when I see individuals and organizations at the highest stress levels imaginable, when I see people unhappy with their jobs and what they are doing, when I see people losing some semblance of work/life balance, More Sales, Less Time is a critical tool to getting sanity back into your life, to be happier, healthier, and to more effectively achieve your goals. I thought I was pretty disciplined at managing my calendar and priorities, but have gained so much from leveraging some of the things Jill highlights. One caveat, don’t be fooled by the title, More Sales, Less Time. This isn’t just about sales, it is for every business professional! Buy a copy for yourself, make sure everyone in your family reads it, buy copies for your colleagues–it will help them, and help you as you work with them.